On September 25th, the Save the Redwoods League announced the launch of the Redwood Genome Project . Save the Redwoods League, Who Are They? Founded in 1918, the Save the Redwoods League serves to promote the conservation of California’s redwood forests. The organization promotes the cause through established partnerships with government agencies, support of research initiatives, forest land acquisition and restoration, and education efforts aimed at promoting engagement with the public . After decades of industrial logging, the current generation of redwoods isn’t as genetically diverse as its ancestors . This is largely due to the practice of selectively breeding the trees to maximize growth, rather than selecting for resistance to disease and drought . As a result, the trees of today are less resilient to environmental stressors than past generations. . 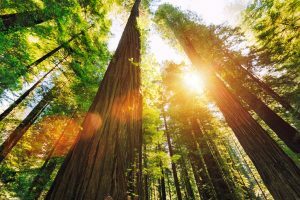 The Redwood Genome Project is a five year effort that will spend $2.6 million to sequence the entire genomes of the Coastal Redwood (Sequoia sempervirens) and Giant Sequoia (Sequoiadendron giganteum) . Armed with this information, the team then aims to selectively breed redwoods to restore their genetic diversity . What alternative questions could be explored with this data?